Tag Archive | I am who I am. I am a people pleaser at heart. In the family unit, I was the peacekeeper as well and the one who tried to mother everyone in sight. I can’t say if it was innate or if it was a role given to me, but it was one that I tried to accomplish with gusto. I ran around trying to help everyone, anxiously trying to make things better and keep people happy. I would try not to ‘upset the apple cart’ on many occasions. I was never good at confrontation and hid from it when I could. I would rather just be peaceful and have everyone love me. Simply put, I wanted to love them all and have them all love me. But the last year and a 1/2 since my Dad’s passing, things have changed in me. There’s been a break in the charm department in my life. It’s like a crater has opened up in my heart and shown me that while I have been trying hard to please everyone in my life for so long, I have not pleased myself at all. While I’ve been mothering the world, I’ve not mothered myself. When there have been times I could have stood up for myself, I sat down instead and seethed. I lived fearing that they wouldn’t love me if I didn’t meet others’ expectations and I’ve now found out that I’m right. And it hurts. It’s not been easy for me since my Dad passed. I’ve tried to soldier on as best as I could. I’ve tried to pay attention to those who needed it and tried to please the rest. I know I’ve not done a great job, but I truly can say that I’ve tried. Something snapped in me though and when it did, I admit that I acted out a bit. Quite out of the ordinary for me for sure and it took everyone by storm. It was not met with kindness and I just couldn’t explain my stubbornness. I think I just had a temper tantrum that’s lasted and the silence that’s built up from it is deafening. It’s very lonely in this transitional time for me. Beloved family members have silenced me by refusing to say that they love me. On the outside, they act normally, but we both know that they are hurt as am I. This intense silent treatment has been hard for us all. I don’t know how to fix things, but I know that I can’t go back to not speaking up. I admit that I swung like a pendulum from being a people pleaser to growling at the mere mention of doing what I didn’t feel like doing. I know it’s been a heartache as most growing pains tend to be. Perhaps it’s my way of dealing with my overbearing father’s passing that I now don’t want anyone else to control me so I’ve become like a rebellious teenager. Dealing with his death, 4 surgeries and learning on my own how to close his business, plus being a wife/mom, running our house plus my Mom’s was a lot for me to handle in a year ~ not to mention the grief which churned up so many memories and feelings that I had stuffed down for years. I just don’t think anyone realized how much it was for me to handle and quite frankly, I was too busy just trying to make it through each day without doing something wrong that I wouldn’t ask for help. In retrospect, I can see now how foolish I was because when I was drowning, I just kept trying to dog paddle my way through the days. Because I was never given the opportunity to act up and I guess I did it with gusto. If I’ve hurt anyone, it’s not that I meant to at all. I just needed to find me and it’s been a long, hard, lonely journey because nobody seems to understand. There’s so much that I dare not say, so much grieving that I’ve done alone, so much that I’ve had to forgive and let go. I still cry for the loss of my Dad, which is a conundrum because our relationship was quite rocky ~ in fact, I cried this morning. Grief does that I think, it sneaks up and gooses you at the strangest times. Who knew that getting rid of my Dad’s phone number would send me in to a wailing tailspin? Perhaps my tear ducts needed a good cleaning ~ yes, that’s it. Believe me, they don’t need to be cleared out for another 2 years after this episode. 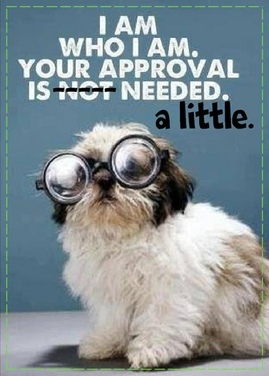 In the meantime, I am working on finding out who I am and not needing approval which is hard for a people pleaser like me. It’s a long road ahead, but I’ll just keep taking my baby steps and hope that others will understand ~ I love you ~ I need you ~ I’m sorry. Please be patient with me. I simply am who I am.